The Northwest Ohio Human Resources Association (NOHRA) and attorney Mark Barnes teamed up yesterday to present a webinar addressing legalization of marijuana in Ohio (Issue 3), application of the potential law to specific laws in Ohio, such as the OSH Act, ADA, and Workers’ Compensation, and effect the potential law may have on employer policies. A Kent State University poll released yesterday shows that if an election were held today, both Issue 3 and Issue 2 (the amendment to prohibit monopolies) would pass, setting up a potential battle in the Ohio Supreme Court over the legality of each ballot measure. Click here to read more. 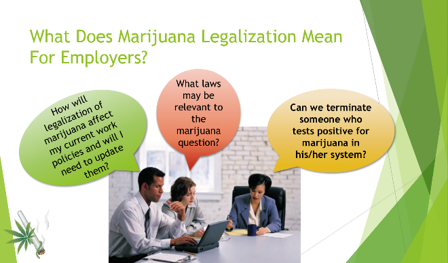 If you missed the webinar, or have questions regarding the legalization of marijuana in the workplace in Ohio, please contact Mark at mbarnes@bugbeelawyers.com.